This Place of Worship was founded in 1887, and we understand it is still open. Spiritualist Meetings began in Belper before the current church was built. It is named Jubilee Hall, as it was built in the year of Queen Victoria's Golden Jubilee. Its foundation stone was laid by Mr. W.P. Adsheads, in whose home meetings began. See also the church's entry on the Spiritualists' National Union website. Belper Spiritualist Church, Belper shown on a Google Map. Places of Worship in Belper shown on a Google Map. I have found many websites of use whilst compiling the information for this database. Here are some which deserve mention as being of special interest for Belper, and perhaps to Local History and Places of Worship as a whole. Information last updated on 19 Mar 2011 at 18:53. 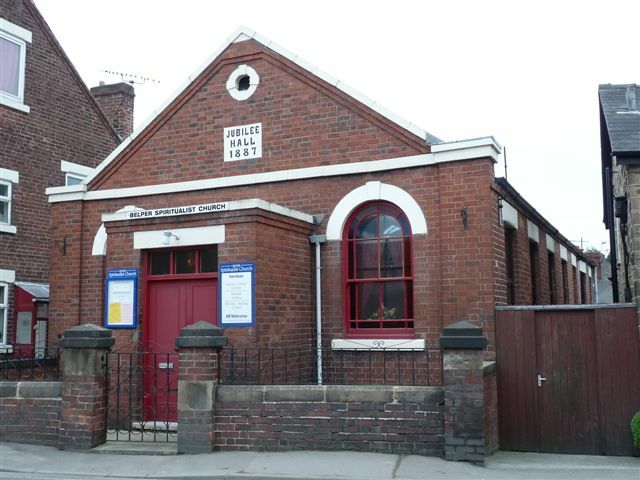 Please also remember that whilst the above account may suggest that Belper Spiritualist Church remains open and accessible, this may not remain so. This Report was created 19 Apr 2019 - 21:03:51 BST from information held in the Derbyshire section of the Places of Worship Database. This was last updated on 6 Feb 2019 at 15:49.